12% Off for Vandy Vape Brand Item. This promotion is from Aug 23rd to 31st Aug. Hurry Up! Ehpro Lock RDA, with 24mm diameter, supporting single coil building, features with two Notch coils for build-free replacement. Simply press the 0.15ohm Notch coil into the deck, then you are capable of wicking the cotton directly. 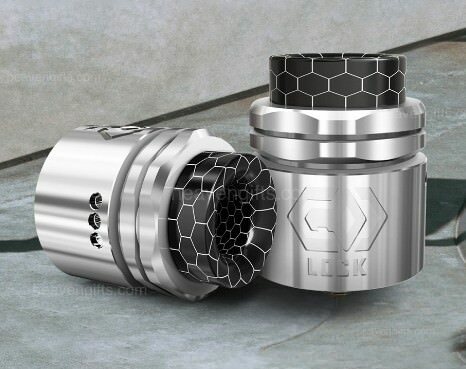 The Lock RDA is also compatible with regular coils. Made of stainless steel and glass, Augvape Skynet Sub Ohm Tank Atomizer comes with 24mm standard diameter and features a exquisite design. The Augvape Skynet Sub Ohm Tank holds up to 3.6ml of e-juice with the standard glass tank section and 5.1ml with the bubble glass tank section which can be conveniently filled via the threaded top fill system with two large fill ports. Equipped with 0.15ohm resistance mesh coil head rated at 60 to 80W that to ensure bring massive cloud and great flavors. With the threaded top filling and bottom airflow system make the refilling easy and can offer smooth airflow. You can adjust airflow through triple adjustable air slots to choose the best vaping ways. Demon Killer Sniper RDA, constructed with high quality Stainless Steel and food-grade PEI drip tip, features Germany PEEK insulator and gold-plate 510 connector. Brand-new side airflow system ensures air direct contacts wires to provide better flavor. The PEI drip tip is healthier and environmental and the detachable structure is very easy to clean. The post deck is convenient to build. Manta Tank, with 24mm diameter and 5.0ml juice capacity, is a new member from the Advken family. The Advken Sub Ohm Tank utilizes the 0.16ohm/ 0.2ohm Mesh coil which is compatible with Dominator Tank/ TFV8 Baby Tank and NRG Tank etc. It features sliding top cap for easy top filling and bottom airflow control.